Modern Mojo jewelry and glass vary from modern lines to traditional details, from the funky to the streamlined, from whimsy to elegance. What the pieces have in common is intention. 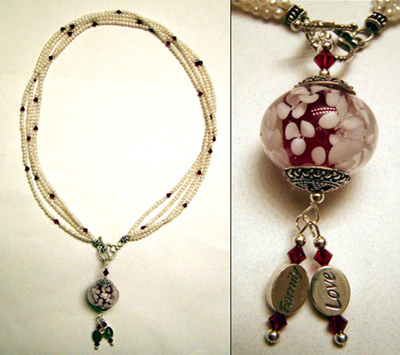 Each piece is made with love and a blessing in my heart for the wearer. I hope that these designs bring light and joy to the people who enjoy them. Below are some examples of the kinds of "mojo" I have worked into pieces in the past. Be utterly and completely you! Please check out the galleries for some of the styles that are available. If you would like a custom piece designed with a "mojo" of your choosing, please contact me at pam [at] modernmojo.com. Please also check out currently available pieces, or see my work in person at Magnolia House in Westminster, MD.